Can now win more than once. 1k points the first time playing on around the 3rd day of the contest. Nada since except sweepstake entries. I've been using firefox, I also keep getting blank space when I "flip" a card. However, the other day, I flipped a card and it said I matched a property in South America. But what is that suppose to win? After you match a pair of pictures, it seems to generate a multiple choice question about the brand. IIRC I got a question when I picked the wrong pictures for a pair too, but at that point I was trying to figure out what I was supposed to do so I'm not sure. You can "win" without getting all three matches right and/or without answering all of the questions correctly. This is just my opinion, but points is points. 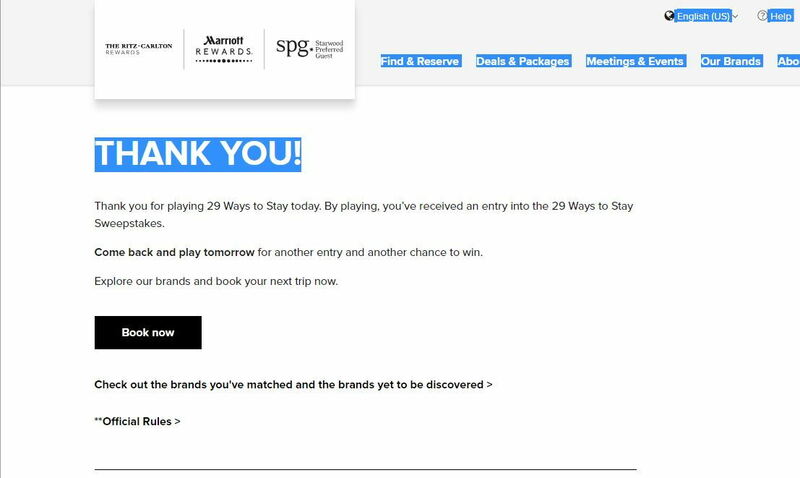 Yes we all want to win more & win often, but it's an instant win of points ranging from 50-20,000, along w/ 4-night stays at individual brands & the GP prize of stays at all 29 brands. I don't regard that as a shoddy sweeps, but that's just me. I know a # of people who have entered & aren't pissed off at Marriott. Perhaps that's something unique to FTers? It's worth entering at least once, as it only takes 1-2 minutes, & odds are you'll win something. If you (generic you) win, great re: whatever it is you won. Move on & don't waste the energy of getting irritated/pissed off. Save that for the true issues, like the lousy IT integration! If you're interested in the GP, then keep entering knowing that's all you're in the running for after the first instant win. Diplomatico, Twickenham and kauppias like this. This promo doesn't show anywhere on my account? I just combined my SPG Marriott account tonight could that have anything to do with it? The points take a few weeks to show up. What I mean is I don't see any way to even play? What happens when you click on the link which is in the wiki? 50 points day one. Nothing at all days 2, 3, 4 or 5. Either the game is set to give you one prize only, then entries all other tries, or they have a bug where the "once per day" rule is incorrectly counting days and thinking that each subsequent entry is the same day as the previous. I'm curious if anyone played once, then waited two or three full days and played again, and if it awarded more points on the second try. It doesn't matter how quickly or accurately you do the matches or answer the questions... you just need to get the game to proceed to complete it - there's no penalty or reward. 50 point is indeed rather pathetic especially you can only win once. Have the rules been updated? Now reads "The total maximum ARV of all prizes is $3,731,553.40USD. Limit one (1) Instant Win Prize per person, per day." It does make you wonder, just did the game and it clearly states another chance to win per day...now we can debate what "win" means. Another chance in the drawing or another chance for an instant prize. Probably trying to get you to play again but wins nothing at the end.